After having to suspend the painting contest on April 7 for weather reasons, the date set for it, as well as for the bike route and parallel activities in the Rocío de la Cámara Park, is WEDNESDAY, MAY 1. The same bases for the contest are maintained. For the bicycle route, the inscriptions made previously will be valid, opening a new registration period until MONDAY, APRIL 29th at the El Cuervo-Hermanos Olmo Cycling Club (Calle Vaguada, 2) from Monday to Friday from 10 am to 2 pm and from 5 to 9pm. Who wants to participate must send an e-mail to: ateneodemanilva@gmail.com, with a brief literary biography for its presentation and the name of the poetry with which you want to participate in the event. Anyone who wants to come as a listener will also be welcome. Admission is free. "The repopulation of Motril: the book of repartimiento of goods of moriscos of 1573"
Within the Cycle of Young Investigators Motrileños, JESÚS RODRÍGUEZ GÁLVEZ , doctor in History, will give the lecture entitled " The repopulation of Motril: the book of repartimiento of goods of moriscos of 1573" . The act will take place next Thursday, April 11, at 8:30 in the afternoon, in the Assembly Hall of the School of Art , and will be presented by Encarna Escañuela Cuenca, vice president of the Motril Athenaeum. ✅ SUNDAY, APRIL 7 The conditions of participation can be consulted in the annexed Contest Rules. The reception of inscriptions will take place in the classroom of the nature of the Parque Rocío de la Cámara. The delivery of the works and their exhibition will take place at the CC Casa de Postas. <img class="CToWUd" style="margin: 0 0.2ex; vertical-align: middle; max-height: 24px;" src="https://mail.google.com/mail/e/1f449" alt="
Presentation of the book "Dreams for children - Book of poetry for children"
"The megaliths: Gorafe and Alicún"
V Centenary of "The return to the World of Magallanes and El Cano"
"Gender violence. Question of State"
Program March - week Mon18 / Fri.
"The dark side of the internet"
Presentation of the Book: "Portraits of a teacher"
Gathering about the Cordovan poet "PABLO GARCÍA BAENA"
Feminism in the twelfth century. Next Thursday, February 21st at 8:30 p.m., in the School of Art , will take place the CONCERT OF CARLOS DE JACOBA AND DAVID DE JACOBA , Gold Medals 2018 of the City of Motril, within the Cycle "The Flamenco Art". The event will be presented by Laura Díaz Enríquez , coordinator of the Cycle and Treasurer of our Ateneo. Attendance to this activity will be, as always, free until full capacity of the Assembly Hall. "The Spanish children of the war in the USSR"
Presentation Book: "The hoax over the plot of Tablada"
Talk colloquium: "My house is my body and my body is my home"
The acts will take place at the headquarters of the Ateneo (calle Ancha nº20) at 7:30 p.m. and end at 9:00 p.m. , except those where different places and times are indicated. The entrance to the acts will be free. Conference "Veganism and meat industry"
The conference will be offered by Javier Sanabria, from the Animal Awareness Association, on January 31 at 8:00 pm at the José Moreno Vargas Andalusian Cultural Center "El Mojiconero" (headquarters of the Athenaeum in the Post House of El Cuervo). Access is free until full capacity is reached and for all media that wish to cover the event. Conference "Five centuries circunaving the planet"
Presentation of the book "Operation Munich"
"Five hundred years of the first round the world"
These days, creativity has no limits at the Ateneo de Málaga. Since last Monday many young people spend their afternoons creating stories that we will see re fl ected today in what they have termed as 'Alunizaje': theater, audiovisual content, poetry, etc. Today Wednesday, at 8:30 p.m., we will be able to see the results of these works. Thus, we await you in this unique experience that comes from the hand of Kaleidoscope, and the Vice-Rectorate of Strategic Projects of the University of Malaga. Presentation of the book "DOLOR DE RAREZA"
Tunisia, a democratic country source of progress and partnership in the Mediterranean. Ateneo de Málaga: "LOOKING TO THE FUTURE"
"Forty years of the Spanish Constitution and Seventy years of the Universal Declaration of Human Rights"
The acts will take place at the headquarters of the Ateneo (calle Ancha nº20) at 7:30 p.m. and end at 9:00 p.m., except those where different places and times are indicated. The entrance to the acts will be free. Presentation book "Preparing the Transition"
The magic vignette in the transition. Interesting conference that will be given by the economist José Luis González tomorrow, Tuesday at 8:00 p.m. in the auditorium of the Mercantile and Industrial Circle of Seville and organized by the Popular Athenaeum of Seville. In the times of crisis in which we find ourselves, this conference will help to improve our economy with the indications that the expert lecturer will provide us in his dissertation. Juan Cantabrana: the painter and his work. Within the cycle "The Author and his Work" of the Ateneo de Córdoba. "The City Of The Three Cathedrals"
At the headquarters of the Ateneo, D. Jordi Verdaguer Vila-Sibill (Bachelor of Law and Theory of Literature and Comparative Literature), family of the poet Jacinto Verdaguer author of the poem "La Atlántida", played by Manuel de Falla and completed by Ernesto Halffter, will present his new historical novel : "The City Of The Three Cathedrals" Free admission until cover capacity. I Days of Natural Therapies ¡A tu Salud! Inauguration exhibition of vintage costume re-enactments: "Dress me with precision: feminine fashion in the era of Bernardo de Gálvez" General spaces 1st floor At 8:00 p.m. Organized by: Plastic and Audiovisual Arts Area Coordinate: Vocalia de Artes Plásticas Through fashion we propose an approach to the figure of Bernardo de Gálvez and his time. A different and attractive point of view, another way of observing and understanding History. A peculiar trip for all audiences. "Raped or dead. An allegation against all the herds and their accomplices "
Conference: "The management of immigration in Europe: the Iberian uniqueness"
The Ateneo de Málaga inaugurates next Wednesday, July 11, the photographic exhibition "Cvn't be a man", with poems by Tomás Cohen (Chile), Violeta Niebla and Ángelo Néstore. Organized by the Vocalia de Artes Plásticas. Organized by the Arbonaida Athenaeum since 2013, and jointly with the City Council of El Cuervo since 2017, the Festival of Street and Free Culture returns with a musical, artistic, cultural and playful proposal for all ages and audiences, absolutely free and with the streets and public spaces as the only scenario. This year, the activity will be located in the Plaza de la Constitución and surrounding areas, as well as in other nearby spaces. Presentation of the book: "Flamenco, Arqueología de lo jondo"
We are pleased to inform you that this Friday, June 22 at 7:30 p.m., at the headquarters of the Ateneo, Mr. Carlos Sánchez Ruiz (Atheneist and Delegate of the Association "Friends of the Telegraph in Spain") presented by the 4th Vice President of the History Section, Vicente Mira Gutiérrez, will dictate a conference under the title of: "First data about the beginnings of the wireless Telegraphy of Cádiz, by the inspector-telegrapher D. Pedro Romero de la Cruz (1866-1918) " Free admission until cover capacity. The Tertulias del Ateneo: "The drones"
The classic of Shakespeare "Ricardo III" reinterpreted by the actor Antonio Ortuño to accompany the viewer on a journey between the delights of evil and the possibility of redemption. Theater, magic and black humor go hand in hand in this work that, after its tour between Córdoba and Valencia, now reaches Almodóvar del Río. Do not miss it! Saturday, June 16 at 9:00 pm, at the Popular Athenaeum of Almodóvar del Río. Euro-Mediterranean Tribune: "The fight against corruption: The need for a European response"
Speaker: Jesús María García Calderón . Ex-Attorney General of the High Court of Justice of Andalusia. Writer and Jurist. Chair: Victoria Abón . President of the Ateneo. Presenter and moderator: Francisco Carrillo Montesinos . Director of the Euro-Mediterranean Tribune. Assembly Hall: June 14 at 8:00 p.m. Organize: Presidency and TEM. Sponsor: Málaga Foundation. The Tertulias del Ateneo: "Active Longevity". Conference and presentation of the book: "Hacia la luz, Six months in Andalucía, 1966-1967"
From the New York photographer JOEL MEYEROWITZ. ACTIVITIES PROGRAMMED BY THE LITERARY, ARTISTIC AND SCIENTIFIC ATENEO OF CÁDIZ, FOR THE MONTH OF MAY 2018. ALL ACTS WILL HAVE PLACE IN THE HEADQUARTERS OF THE ATENEO, WIDE STREET, 20-1º, AT 19.30 HOURS, EXCEPT IN THOSE WHICH ARE INDICATED PLACE AND DIFFERENT HOURS. THE ENTRY WILL BE FREE TO COMPLETE AFORUS. In search of the keys to the revolution :: Citizen empowerment. Place: Cajagranada Cultural Center of Motril. The conference-documentary will be given by MARINA ALCALDE GÁMEZ , graduate in Advertising and Public Relations at the Faculty of Communication Sciences of the University of Málaga, and presented by Encarna Escañuela Cuenca , vice-president of the Motril Ateneo. Free entry until complete seats. Presentation of the novel "The glow of the butterflies"
Round table: "Three young people think about the current Catalan situation"
Next Tuesday, May 22, at 8:30 p.m., the Ateneo motrileño begins a new cycle of activities in a Roundtable format on current issues. This first meeting is entitled "Three young people think about the current Catalan situation" , and will be moderated by the atheist ENRIQUE COBO FERNÁNDEZ, accompanied by YERAY CASTRO, TRINIDAD MÁRQUEZ and PABLO LÓPEZ. The event will take place at the Palacio Ventura Art School , with free admission until full capacity is reached. Fourth lecture: "In memory of the women who stayed"
The Tertulias del Ateneo: "Renewable energies". Charla - illustrated "La copla flamenca in its historical, political, economic and social context"
LA COPLA FLAMENCA IN ITS HISTORICAL, POLITICAL, ECONOMIC AND SOCIAL CONTEXT To the word: Pepe Carmona To the cante: Paco Dios On guitar: Rafael Ruz Place: Ateneo de Córdoba c / Ángel Ganivet 3, local; Antonio Perea Room. Talk-colloquium "Law of Animal Protection in Andalusia"
The Tertulias del Ateneo: "The Telomerase". "The music of the cosmos, the atoms and the stars"
The Tertulias del Ateneo: "Sexuality and eroticism in older people". "The Constitution: achievements and futures"
"Megalithic in Andalusia, Dolmens and Megaliths in the South of the Iberian Peninsula"
Pluripoetic recital: Food on Charter 2. José Luis Casas Sánchez, historian, will present the event and moderate the debate that will be opened after the screening of a documentary made in 1931 about this historic proclamation that comes from the filmographic collections of the "Niceto Alcalá Zamora" Board. The Andalusian :. Epic of Andalusia. NEXT ACTS OF THE ATENEO DE CÓRDOBA Cycle Debates. Headquarters of the Ateneo. Monday, April 2, 7:30 p.m. Talk - Colloquium with Antonio Barragán Moriana: "Comments on the local report of the Historical Memory in Córdoba". Presented by José Carmona Pulido. Wednesday, April 4, 7:00 p.m. Poetic chat Friday, April 6, 8:00 p.m. Performance of the classical music group ELEK QUARTET. "E constituent process: a proposal from the left"
Next April 6, at 8:00 pm and at the Casa de la Juventud, the Citizen Athenaeum of Cabra will have the honor of receiving Julio Anguita. He will speak to us about the need to reform the Spanish Constitution, after almost forty years in force. "Reflections on Agroecology: work and territory seen from the Vega de Granada"
Presentation of the book "María y las brujas del volcano"
Admission is free, for all activities, to cover capacity. "In the origins of Spanish and Moroccan archeology: Pelayo Quintero Atauri"
Friday, March 16, 7:30 p.m. Place: headquarters of the Ateneo de Cádiz. Speaker: the archaeologist Manuel Parodi Álvarez. Presents: the ateneist D. Eugenio Belgrano. Chair: Mr. Ignacio Moreno Aparicio (President of the Athenaeum) Conference: " In the origins of Spanish and Moroccan archeology: Pelayo Quintero Atauri " . Free admission until cover capacity. Does Córdoba have a solution? How to educate today. Ideas, values ​​and attitudes for a necessary change. The next THURSDAY, MARCH 15 , at 8:30 in the afternoon, will take place the interesting conference "How to educate today: Ideas, values ​​and attitudes for a necessary change" that will be taught by Professor JUAN SANTAELLA . 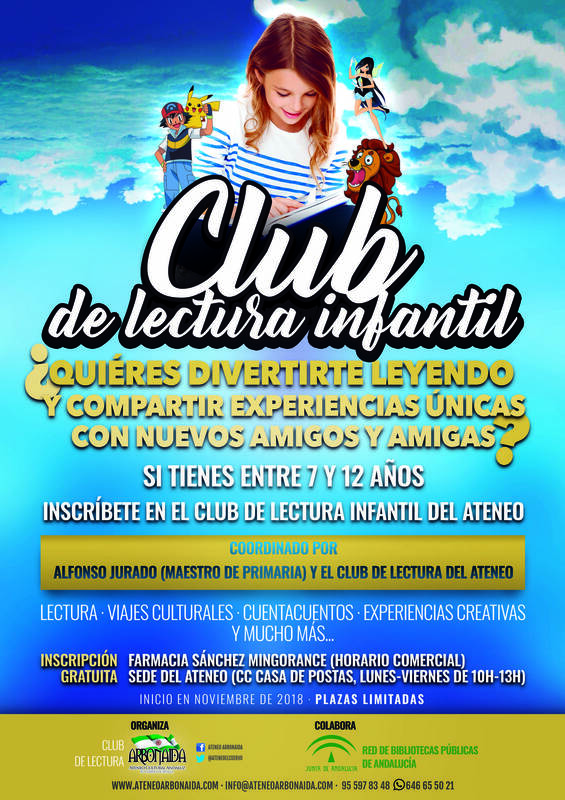 The event will be held at the Ventura Palace Art School in Motril and will be presented by Ángel Pacheco Claros, president of the Motril Athenaeum. "In search of our origins"
Conference: "The influence of physical activity in the adult stage"
Conference-colloquium "The influence of physical activity in the adult stage" Imparted by Rubén Trigueros Ramos , doctor in Education from the University of Almería. Day: Thursday, February 1 Time: 20:30 Place: Hall of Acts of the Art School of Motril. Free entry until complete seats. "The Way and the Bridge as essential elements of the Jacobean Routes"
Conference: "Murillo Painter of popular life"
Free entry until complete seats. I Literary Week 2017 of the Ateneo de Córdoba. Thursday, November 16, 20: 30h. «THE MANAGEMENT OF MIGRATORY MOVEMENTS IN ITALY» , Lecture-symposium by Massimiliano D'Onofrio , in the Assembly Hall of the School of Arts of Motril. The act will be presented by Ángel Pacheco Claros , President of the Motrilian Athenaeum. Lecture-colloquium "The Fertile Heritage on the Tropical Coast" given by the architect Dr. Javier Castellano Pulido and presented by Encarnación Escañuela, vice-president of the Ateneo de Motril. Inauguration of the Exhibition "18 Cadiz of the XVIII City and Society of the Tricentennial" this Thursday 20 of July at 20h. For artisans who want to set up their place in the V Night in White to be held on 26 August in El Cuervo de Sevilla. Presentation Book "My little girl wants a cell phone. Essay for parents lost in the technological education of their children. This Friday, July 7th at 9:00 p.m., at the headquarters of the Popular Ateneo de Almodóvar del Río, will be the presentation of the book "My Resurrections" by Martín Segovia Ruiz (writer Cuco novel, with intense experiences, Natural claimant, with a history of self-improvement, ...). IV Concurso de Cante Flamenco "The Hut Juaniquín"
Presentation of the book: "The Asymmetric Soldier"
Conference entitled "Humanitarian assistance from the inside, where it is most needed" to be given by Dr. José María Echevarría , Vice President of Médecins Sans Frontières. The event will be presented by Dr. Pilar Carrasco Rodríguez and will take place at the HERNÁNDEZ QUERO MUSEUM in Motril. Free entry until complete seats. Discussion day "Does Cordoba need a Natural Park?" Presentation of the book "The fleet of spices". Ateneo of Sanlúcar de Barrameda. "Adversus Haereses, apologetic essay on Western history"
Presentation of the book by Macario Valpuesta. Presentation of the novel "The Andalusian Epic of Andalusia"
I Showcase of Children's and Youth Theater CRÉATE. II Contest of fine arts "ART YOUNG"
Cinema Ateneo Joven: "El Castillo Ambulante"
Presentation of the book: "33 Reflections that Christ would make in my place"
Thursday, May 11, 20: 30h Place: Lecture Hall of the School of Art Motril Singer - songwriter ÁNGELA MURO, within the IV CYCLE Chanson IN ATENEO, will offer a concert entitled "Chinese Tales Havana" which will debut songs that will be part of their fourth album, and will be presented by Antonio Fernández Ferrer, Ateneo secretary of Motril. He is accompanied by the musicians Alejandro Tamayo (bass), Pepe Dougan (keyboards), Zeque Olmo (percussion) and Mario Gutiérrez (guitar). Free entry until complete seats. The Ateneo Arbonaida organized two conferences on the war in Syria and the plight of refugees. Days 27 and 28 April Time: 20: 30h Place: Municipal Library in the Casa de Postas CC El Cuervo. Monday 3 April at 19.30. Presentation of the poetry book "Voices" of Francisco Javier Ortiz Diaz, presented by Antonio Varo Baena. Tuesday, 4 April at 19.30. Chat - colloquium "Death with dignity: current situation", by Luis Montes, presented by Isabel Torres Calzada. ARTS M, 28 MARCH AT next 8 pm Professor of Art History at the University of Granada José Cabrera Cruz Policarpo offer an original and interesting conference on Water Culture in Granada Nazari and modern. The event will be presented by Encarnación Escañuela Cuenca, vice president of Ateneo de Motril. Will be held in the Auditorium of the School of Art Ventura Palace. Free entry until complete seats. Painting Competition III Outdoor Laguna de los Tollos April 2, 2017 in El Cuervo de Sevilla Organized by the Ateneo Arbonaida, the Laguna de los Tollos Environmental Association and with the cooperation of the City of El Cuervo. Contacts: Concha Mingorance (647241091) and Maria Luisa Gomez (620,678,722). Monday 20/03 will take place in the Aula Andreu-Urra, the College of Physicians of Seville, the Conference-Workshop on Social Networks imparted by Sandra Suaza and presented by Francis Moya, president of the Popular Ateneo de Sevilla. Documentary "D. Pedro, El Maestro Mayor"
Inauguration Photographic Exhibition "NAKED darlings"
The Ateneo de Cabra organized a talk for the next day on February 10, at 20:00 pm in the Youth House of Cabra. Dr. Luis Montes, President of the Federal Association Right to Die with Dignity (DMD), will talk about such an exciting (and controversial for some) issue as the right that we should have to own our life and our death, ultimately, the right to die with dignity. "Palestine, the peace process to the struggle against Apartheid"
Maria LANDI, human rights activist, accompanist and international observer in the West Bank, was in Yanun (Nablus) with the EAPPI in Hebron with CPT in Bethlehem with Kairos Palestine and Deir Istiya (Salfit) with IWPS. He is a correspondent in Palestine Brecha of Uruguay and columnist for the Mexican portal Desinformémonos. This talk will discuss the current situation in Palestine, Zionism as a colonizing project of Europe and the two - state theory and tools of peaceful struggle as the BDS. Access is completely free, for both the public and the media. Citizen Ateneo de Cabra against gender violence. Ateneo de Algeciras: Film Festival "Algeciras FANTASTIKA"
A multidisciplinary cultural event that specializes in the fantastic nature, suspense, horror and science fiction. Presentation of the book "THE AMAZON OF THE REPUBLIC"
Next Friday 14 at 20.30 h. in the Assembly Hall of the Youth House of Cabra, will be the presentation of the book "The Amazons of the Republic" written by Jose Luis Casas, historian and writer. Cultural programming in September 2016. Ateneo de Mairena del Alcor, Sevilla. Sixth Edition Poetry in the Garden at the Casa de los Tiros. Ateneo de Granada in collaboration with the Centro Andaluz de las Letras. The next day, Sept. 6 the Sixth Edition of C cycle with the intervention of the poet Mariana Tapia, accompanied by Michelangelo Alegre, which will continue in the following weeks Reinaldo Jimenez, Marga Blanco and Jose Carlos Rosales opens. We hope that we accompany these and traditional evenings. On Thursday 29 September World Heart Day is celebrated. From the Popular Ateneo de Sevilla, we invite Days of Health and Welfare, with the following program: 11:00 AM. Will your heart: Yoga practice. 12:30 PM. Two systems to calm your heart, Taichi and Qigong. 20:00 Roundtable: World Heart Day. 21:30 h. Solidarity Concert Harp, French Horn, Flute. The Athenians of Andalusia represented at the Festival of Young Creation "Eutopía 2016"
Hiking Ateneo Sanlucar de Guadiana. Regulatory bases STREET ART CONTEST I BLANKE-ART. Contest that is integrated within the proposals for the IV White Night, Festival of Culture and Leisure Callejera to be held next August 27. In the foundation it has all the information necessary to participate all those street performers who want in any discipline or art form. This year the activity revolves around the Spanish Civil War, on its 80th anniversary, consisting of the projection of films referred, after an introduction to the historical context by the local historian Antonio Amarillo, and a subsequent discussion of the film and the historical fact on which versa. The goal is, once again, bring history and cinema to the streets of El Cuervo, bringing both elements to neighbors. The Literary Trail in its third edition and is an activity, like the film series, totally free, requiring prior through the means specified in the registration cartel. They can participate people of all ages since the route does not exceed 5km and is completely flat and comfortable. It is recommended to wear appropriate clothing and shoes, water and individual food. Cultural trip to the archaeological site of Baelo Claudia in Tarifa. The Cultural Ateneo Andaluz Arbonaida, El Cuervo de Sevilla, organizes this cultural trip to the archaeological site of Baelo Claudia in Tarifa next August 13. The activity consists of guided tour archaeologist, free time to enjoy the magnificent beach of Bologna and entry to witness the play "I Edito King", which will take place at night, outdoors, in the theater of the site itself Roman. The registration fee is 15 euros and includes bus from El Cuervo, entrance to the site and the theater. Limited places, book yours before August 9. Ateneo de Salúcar de Barrameda. Activities for the month of April. The Ateneo de Sanlúcar has organized two conferences for the month of April: 14/04 "THE SECOND REPUBLIC: THE FIRST SPANISH DEMOCRACY" by D. CANCELA CARO DIEGO (Professor of Contemporary History at the University of Cádiz). 15/04 "POETRY IS THERE Don Quixote?" By Mr. ALBERTO NUNEZ ANGEL MORENO (Doctor and Writer). II Contest "Fast Painting Outdoors". April 3 in El Cuervo de Sevilla. III Cultural Week Ateneo de Jerez. Ateneo de Mairena del Alcor (Sevilla). II Contest of short stories. Cycle Poets in the Athenaeum 14/03 at 19: 30h Intervention of the poet José Luis García Clavero. Conference: "IPEFC Project, a national proposal to improve health"
The Assembly Hall of the School of Art will be held and will be taught by MANUEL MARTÍN OLVERA , Bachelor of Science in Physical Activity and Sports, Diploma in Physical Education and Co-Director of the Professional Institute of Physical Exercise and Cancer. The act will be presented by Laura Díaz Enríquez , treasurer of our Ateneo. VI Edition of La Choza de Juaniquín, Flamenco festival. The Arbonaida Athenaeum of El Cuervo, with the collaboration of the City Council of El Cuervo, organizes the VI Edition of La Choza de Juaniquín, a Flamenco festival that will be held in El Cuervo de Sevilla from June 26 to July 7. Presentation of the book "Amado Pulpo"
"Cycle of Young Investigators Motrileños / as"
THURSDAY: NOVEMBER 30 20.30 HOURS Conference entitled «INNOVATION FOR SOCIAL IMPROVEMENT» Taught by ESTHER GARCÍA GARALUZ , PhD in Engineering. Presented by ANUNCIATA VINUESA PONS , Vocal of the Athenaeum of Motril. Place in the Assembly Hall of the School of Art. Free entry until complete seats.